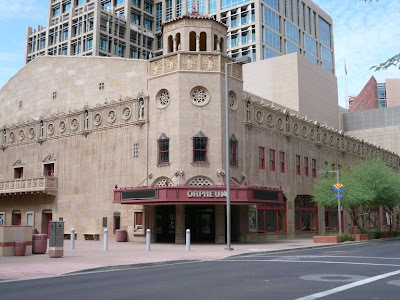 The Orpheum Theatre in downtown Phoenix is another Phoenix Point of Pride. If you look closely you can see the Point of Pride sign on a light pole next to the building. Built in 1929, it went through and extensive renovation and was re-opened in 1997 as a modern theatre of the classical style. It can seat 1364 people and has a line-up of events from concerts to big musicals. 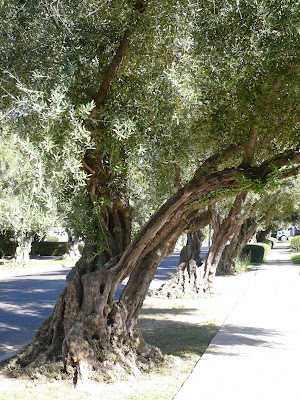 Olive Trees: Since I brought up the subject of olives two days ago, I thought I’d show you some real olive trees. Olive trees are Mediterranean natives, but are grown in the United States in California, Arizona, and parts of Texas where the climate is mild and the air is dry. Olive trees cannot tolerate cold winters or high humidity. They are also shallow rooted, so they will not do well in windy areas. There is a local company that produces a very high quality olive oil. While the trees in my photo are providing much needed shade in a central Phoenix neighborhood, olive trees are farmed in areas near Phoenix. In fact, I cook with a particularly good olive oil from the Queen Creek Olive Mill just south of Phoenix. So, yesterday’s picture wasn’t of olives after all. 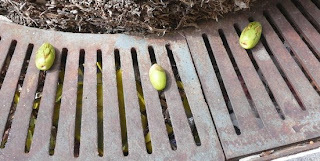 Those green 'olives' are actually green dates that have fallen from the tree. 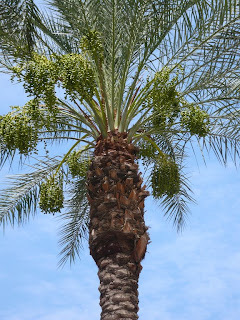 The Date Palm is a palm in the genus Phoenix. How appropriate for the city of Phoenix, don’t you think? Date Palms are widely cultivated for their edible fruit however, I’m fairly certain this one is just for decoration since it was located on a downtown street. These olives look as though they have been rejected by the bar tender! But wait….maybe these aren’t olives after all. Check back tomorrow to find out for sure. Since this is Sunday, I thought I would picture another church in Phoenix. This one is St. Francis Xavier. Though not as old as the church featured yesterday it has some interesting architectural features. St. francis Xavier opened in July of 1959. The design is called modern Renaissance and it was built of non-combustible materials from the concrete floor to the concrete roof topped with Spanish tile. The grand dome is seamless poured concrete topped with a Celtic Cross. The church is located on North Central Avenue on property that was donated by Mrs. William Henry Brophy in 1928 to create a Jesuit parish. On the same property is the campus of Brophy College Preparatory and Xavier College Preparatory schools. 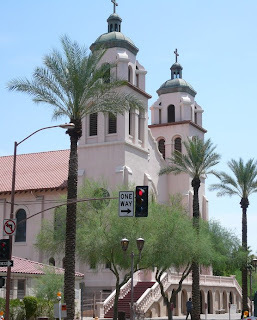 Founded in 1881, St. Mary’s Basilica is the oldest Catholic church in the city of Phoenix. It’s location in the heart of downtown Phoenix, sometimes makes it hard to spot among the towering office buildings, but it’s worth searching out. During his 1985 visit to the United States, Pope John Paul II proclaimed it to be a minor basilica. 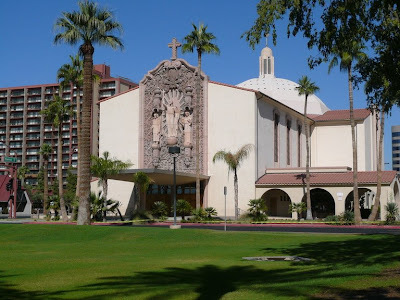 St. Mary’s is on the National Historic Register and is also a Phoenix Point of Pride. 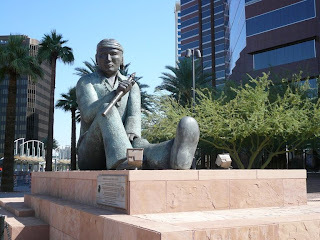 This very beautiful and cool looking spot is located right in the heart of downtown Phoenix. Next door to St. Mary’s Basilica, is a lovely garden that features shaded paths, fountains and bronze art works. I’ll feature more from this location in future days. This building has had many tenants before the chain Baja Fresh moved in. At one time it was a fine dining establishment. Situated in heart of downtown Phoenix and wedged between two very tall high-rise buildings, it seems that Baja Fresh has had the most success of all the previous incarnations. It certainly makes a rather elegant looking fast food restaurant. Coming soon to my neighborhood is a new Fresh & Easy Neighborhood Market and I can’t wait. 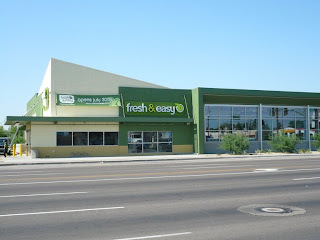 Fresh & Easy is owned by the well-known British grocer, Tesco. The company is environmentally conscious and treats both their customers and employees with a high level of respect. To further the “neighborhood market” concept, the stores are only around 10,000 square feet and they offer organic foods, fresh fruits and vegetables, and prepared foods along with the everyday items. Located near the State Capitol building and dwarfed by a State of Arizona Office Building is this beautifully preserved Queen Anne house. This house was originally built for a pioneer physician, John M Evans and his wife Jennie. The house is actually being used now by the Library Development Division of the Arizona State Library. 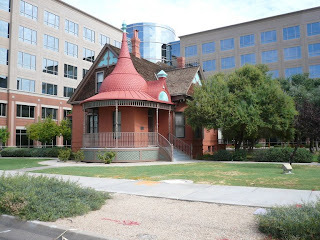 Phoenix has a number of these historic old homes that have been restored for a second life as a museum, or office building and there are even some that are still single family homes. Staying at yesterday’s location, the Phoenix Plaza Offices, this enormous bronze is prominently displayed at the corner of two busy streets, Thomas Road and Central Avenue. This bronze is a special tribute to the Navajo Code Talkers who bravely served the nation during WWII. The artist, Doug Hyde created this piece in 1989. The inscription says “This tribute represents the advancement of peace for all generations.” A beautiful thought. 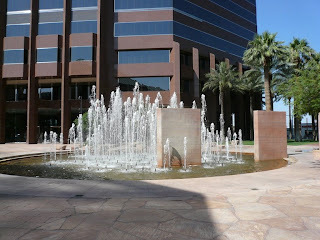 This fountain is part of the Phoenix Plaza Office complex located in the mid-town business district. It sits in the middle of the complex for the enjoyment of tenants of the buildings and guests of a nearby hotel. You will find many pleasing water features scattered around the city. You might think that in a desert, the use of water in such a way might be a little foolhardy. Fountains are not usually heavy users of water, but they are still subject to a variety of regulations. Developers must meet some stringent design specifications in order to obtain a permit to add a water feature. Today is Farmer’s Market day in my neighborhood. The extreme summer heat in Phoenix does not discourage the local farmers from selling their products in an open air market and it certainly doesn’t discourage the customers. I had a hard time finding a place to park last Saturday. This market employs the use of huge air coolers and fans to take the edge off of that 100+ degree heat. 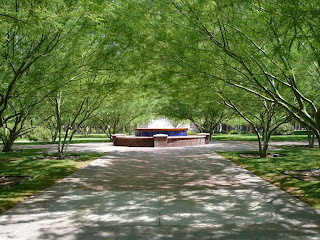 Phoenix has many beautiful parks and green spaces. I’m sure I’ll have an opportunity to feature many of them on this blog as time goes by. Today I’m going to feature a very small park that is dedicated to survivors of cancer. 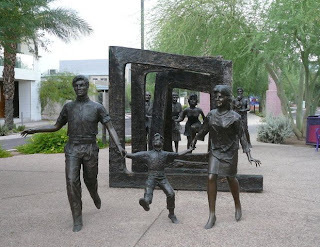 Richard and Annette Bloch (he founded H & R Block) have sponsored Cancer Survivor Parks in many cities around the country and the Phoenix park was dedicated on March 6th 1999. One of the main features of this park is a sculpture by Victor Salmones that he claims to be his finest labor of love. The figures in the back represent cancer patients and their supporters, the maze in the middle represents treatment, and the figures in the front represent the joy of a successful treatment. Just picture yourself sitting on this lovely patio, enjoying a little afternoon refreshment and the warming Arizona sunshine. This patio is located just off of the lobby bar and faces a vast green lawn framed by the wings of the hotel. Many, many movie stars and other celebrities have enjoyed themselves at this famous resort. Fred Astaire, Marilyn Monroe, Bob Hope, Bing Crosby, and Spencer Tracy have all vacationed here. I personally have seen Tony Bennett relaxing in the lobby lounge. Here is another picture from the famous Arizona Biltmore Hotel. In this picture, you can see some of the masonry work that was influenced by Frank Lloyd Wright. In the foreground are two statues that are now called the Biltmore Sprites. These sprites have a long history. They were originally created for Midway Gardens in Chicago which closed in 1929. The building was demolished and pushed into Lake Michigan as a breakwall. It is said that the sprites were rescued by a member of the wrecking crew who held on to them at his farm for many years. They passed through many hands over the years and were eventually donated to the Arizona Biltmore by the Taliesin Associated Architects. They have found a welcome home here in familiar surroundings. Speaking of Frank Lloyd Wright influences, this beautiful stained glass window is located just inside the front entrance of the Arizona Biltmore. It is entitled Saguaro Forms and Cactus Flowers. It was originally a design Wright created for a cover of Liberty Magazine. It was later fabricated by students of Taliesin and installed in the hotel in 1973. Much of Wright's work was inspired by nature and the stark beauty of the Arizona desert influenced a great deal of his western work. Yes, it does rain in Arizona. Between June 15th and September 30th (the official monsoon season in Arizona) storms may occur. These storms occur during the summer months throughout the southwest region of North America caused by a change in the wind flow to a southerly or southeasterly direction. That causes moisture to stream northward from the Pacific Ocean and the Gulf of Mexico. 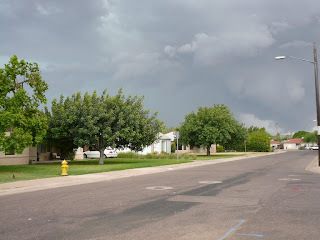 Monsoon storms can range from minor dust storms to violent thunderstorms. They usually start with heavy winds that sometimes result in a visible wall of dust hundreds of feet high moving across the valley. Or, they can be like the one I photographed last night, a little bit of wind and some very welcome rain. Best of all, the temperature cooled down to a balmy 75 degrees! 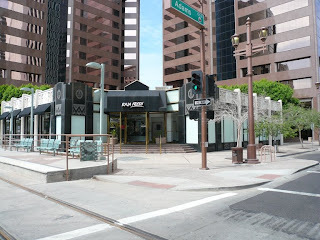 This is a view of the front of the Arizona Biltmore. It was opened February 23, 1929 as part of the Biltmore Hotel Chain. The architect was Albert Chase McArthur, but it is mistakenly attributed to Frank Lloyd Wright who served as a consultant for the masonry construction. Over the years, many Frank Lloyd Wright influences have been added to the hotel and grounds, adding to the architectural confusion. There is even a restaurant inside the hotel named "Wright's". I'll post more pictures of the hotel in the future. The Phoenix Pride Commission along with the citizens of Phoenix have named many locations as "Points of Pride". These are places people would be proud to tell friends and visitors to be sure to see. They are Phoenix's most popular landmarks. This sign names the Arizona Biltmore Resort and Spa. I'll post pictures of it in the future.